The St. James hotel stands watchful over Selma, Alabama from its perch on the Alabama River banks. Both the St. James and Selma went through a spell where much of the area was depressed, dilapidated, and forgotten, but local groups and the government have been working to revitalize the area, and their diligence seems to have stirred up more than they bargained for. 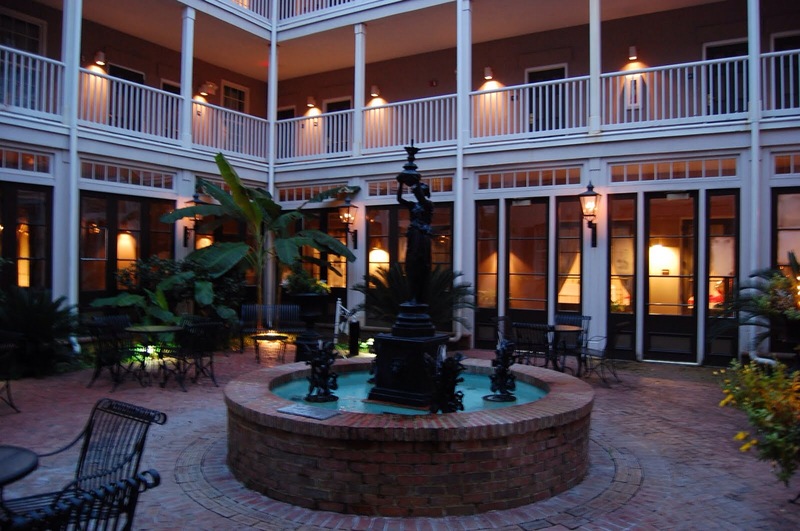 The St. James Hotel in Selma, Alabama, is considered to be one of the most haunted places in Alabama. Many visitors to the hotel have reported accounts of hauntings and paranormal events. Located in the center of the historic district, overlooking the famous Alabama River, the building was constructed in 1837 and opened as The Brantley. During the Civil War, the Brantley was occupied by Union troops during the Battle of Selma. Due to its concentration of Confederate arsenals and factories, the occupying army burned much of the city. Fortunately, the St. James and other structures on Water Street were spared. Together they form the heart of the revitalized historic district and represent one of the finest collections of antebellum industrial buildings in the South. Following the war, the hotel was operated by Benjamin Sterling Turner; the first African American ever elected to the United States Congress. He reportedly hosted the legendary outlaw brothers Frank and Jesse James in 1881. In 1892, the hotel fell upon hard times and ceased operations. The doors were closed on the building, and were not reopened for a century. A group of investors purchased the old hotel and after putting in approximately $6 million in restorations, they were able to officially reopen the doors of the establishment in 1997 as the St. James Hotel. Since its reopening, two of the most reported “hauntings” in the hotel include Jesse James and his girlfriend Lucinda. Several have claimed to have seen the apparition of a man dressed in attire that was common for a man in the late 1800s. He is most often seen in the rooms in which he typically stayed – rooms 214, 314, and 315. However, he also has been sighted at a certain table in the bar. Many things are known about Lucinda. For one, she enjoyed the scent of lavender so much that when someone smelled the scent, they knew she was near. Today, several witnesses claim they are able to smell lavender with no logical explanation. In other instances, a full apparition of Lucinda is said to be walking the halls of the structure. In the area of the courtyard, many strange events have been reported. First, several witnesses have observed what appears to be residual hauntings of individuals who are fully clothed in dress that was common to the 1800s. They seem unaware of the “living” surrounding them. Additionally, the sounds of apparent ghost dogs can be heard in the area. Jessie James, some have said, once owned a black dog that was his companion for many years. Many guests at the St. James have reported hearing a dog running up and down the halls. Also, guests in the hotel would often complain about a dog that would bark non-stop in the courtyard. When management would look into their complaints, no dog was ever found in the courtyard. Psychics and investigators have been brought into the St. James to give the current management a better idea of what is happening in the hotel. Interestingly, they have picked out more than just these 3 entities. Psychics have described groups of apparitions in the inner courtyard, dressed in 1880′s clothing, going about their business and unaware of the living. Perhaps it is these ghosts of the past that cause the odd, inexplicable sounds heard from that space. Mischievous entities will bang glassware together until told to stop, a man has been seen sitting on a bench in the drinking room, and in room 304, a cook who was staying in the room complained about the curtains moving for no logical reason and bright flashes of light. A psychic claims to have spoken to that specter and discovered that the entity was angry that he passed away before finishing some business he wanted to do. Whether you believe in the supernatural or just enjoy visiting beautiful historical landmarks, the St. James Hotel should be added to your list of must-see Alabama locations. Abercrombie & Fitch goes supernatural in this good warlock vs. bad warlock fantasy/horror flick starring models-turned-actors Steven Straight (10,000 B.C.) and Taylor Kitsch (Friday Night Lights), as well as a pre-shag Chace Crawford. Between that and this picture, do you need any further explanation on why you should rent it? Henry Wadsworth Longfellow, one of the “Fireside Poets,” wrote lyrical poems about history, mythology, and legend that were popular and widely translated, making him the most famous American of his day. I’ve always loved a good ghost story. Do you think ghost stories are silly or interesting? Do you have a favorite? Do you believe in ghosts? I find ghost stories fascinating, and I do have a few favorites. And, I do believe in ghosts. I think some souls just have a hard time moving on in the afterlife. My favorite holiday of the year is Halloween. Since Halloween falls on a Friday this year, I may even try and do something special for my students. I will try and make it a fun week for my students. I know my English class will be reading Macbeth, which has the wonderfully evil witches. I’m not sure what I will do special for my history classes, but I might tell some historical ghost stories. The kids love them. Halloween the day when we usually don’t have to wear our masks anymore. I think that this is the reason why it has long been a favorite holiday for gay men. My best friend had her annual Halloween Party this last weekend, but since she loves in Louisiana, I can’t make it down every year, but when I go, it’s always a blast. This Saturday, I will be going to a Halloween party hosted by a co-worker. In an effort to wear a fairly simple costume, I decided that this year I will go as Clark Kent. 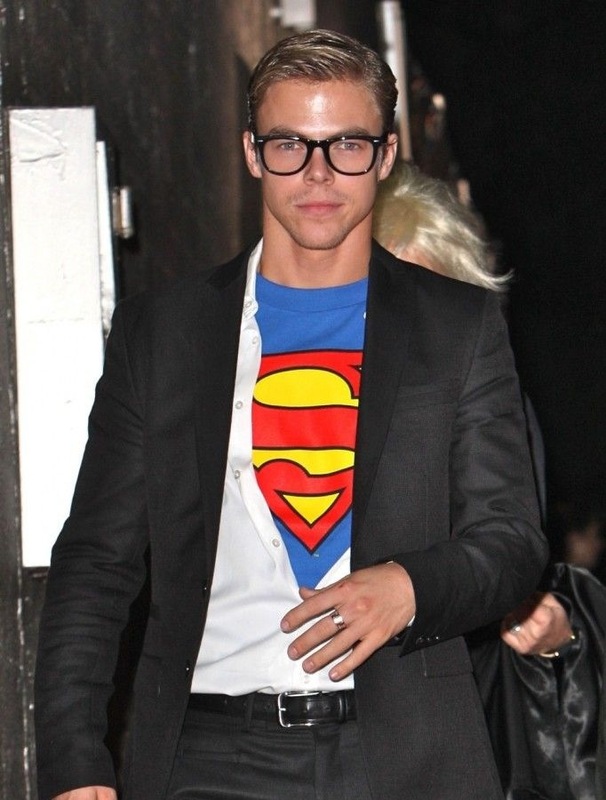 I won’t look anywhere near as good as Derek Hough does above, but I will go as an out of shape Clark Kent. So do any of you have Halloween plans? Will you be going in costume? If so, what will be your costume? Leaning on the Everlasting Arms is a hymn published in 1887 with music by Anthony J. Showalter and lyrics by Showalter and Elisha Hoffman. Showalter said that he received letters from two of his former pupils saying that their wives had died. When writing letters of consolation, Showalter was inspired by the phrase in the Book of Deuteronomy 33:27. Isn’t it a great thought to think that God is supporting us, and that His arms are strong enough to hold us during difficult times? That truth should provide a refuge for us. In times when relationships disappoint us or finances fail us, it is encouraging to know that there is one who is everlasting and whose arms are there for us to lean on. The Apostle Paul tells us about a weakness he had in 2 Corinthians 12. He referred to it as a thorn in the flesh. (I have heard of some scholars that speculate that it was homosexuality, since Paul was Greek and his relation to Timothy was thought to be pederastic. However, this is pure speculation and remains a 2,000 year old mystery.) Paul prayed that this weakness would be taken away. He prayed 3 different times, and God chose not to remove the “thorn.” He then tells us about an important spiritual truth. If the “thorn” was Paul’s homosexual urges, then I would speculate that God did not remove the thorn because God did not see it as a thorn or a weakness. Whatever The perceived weakness was, the truth is that God uses our weaknesses, our flaws, and our personal challenges, and does something extraordinary. He takes His strength and our weaknesses, and He does something awesome with that combination. He allows us, in weakness, to share in His glory and power. Paul then makes the following statement “Therefore I will boast all the more gladly about my weaknesses, so that Christ’s power may rest on me. That is why, for Christ’s sake, I delight in weaknesses, in insults, in hardships, in persecutions, in difficulties. For when I am weak, then I am strong.” What an amazing statement! Delight in weaknesses? insults? hardships? persecutions? and difficulties? To be honest, I struggle with having that kind of mindset, even though I know it is truth. A bath and a book: what could be more relaxing? I have to admit, when I think of transitioning transgendered people and sexual reassignment surgery, I have wondered how it all works. I doubt anyone can honestly say that they haven’t thought about it. That being said, I always wanted to know more about each of their journeys. I will be buying tune books and reading them, and you can be sure that I will let you know in a few weeks what I thought of them. Though Arin and Katie are no longer a couple, they do remain good friends. Each have gone their separate ways with college and since they were not seeing much of each other they decided to remain friends but no longer date. Also, Katie has undergone full reassignment surgery, whereas, Arin is continuing to hope to have the bottom half of the surgery done sometime in the future. I hope both of them the best can’t wait to read their memoirs. Aloof dance superstar Jared is a sweet, vulnerable man and Dawson’s life suits him like a fitted ballet slipper. They forge a long-distance romance from their love of the theater and the magic of Denny’s. At first it’s perfect: Dawson gets periodic visits and nookie from a gorgeous man who “gets” him—and Jared gets respite from the ultra-competitive world of dancing that almost consumed him. That is until Jared shows up sick and desperate and Dawson finally sees the distance between them concealed painful things Jared kept inside. If he doesn’t grow up—and fast—his “superstar” might not survive his own weaknesses. That would be a shame, because the real, fragile Jared that Dawson sees behind the curtain is the person he can see spending his life with. Amy Lane is known for her angst ridden books, and I have to admit, this one is low on the angst. I don’t believe I cried even once. This is not a bad thing. It was just a beautiful story. Furthermore, as the advisor for my schools drama club (I knew nothing about theater before being given the task), I found the technical aspects of being behind the curtain and the emotional aspects of being in front of the curtains very intriguing. I couldn’t identify with either aspect because I’ve never acted, and my little hundred year old stage doesn’t even have electricity (we use makeshift lights and extension cords, covering the lack of lights with onstage lamps and hiding the utility lights that we end up using). We are low tech in the extreme. But I think my little club does a fantastic job with what they have, and I do the best I can. I’ve even written a play for them next semester. But I’ve gotten off topic…. The book was heartwarming in many ways, and it had a little angst in there, just not much. Take a virgin gay boy who is cute but awkward and goofy and put him together with an absolutely beautiful superstar ballet dancer, plus their friends, and you have a wonderful cast of characters. Some characters you might not like at first until you get to know them, but by the end, you’ll love them all and root for each one. There was one other reason why I fell in love with this book. I have a dear friend, who lives quite a ways away from me, who just graduated college in May and has been trying to find a job. He has a boyfriend and finding a job may take him away from his boyfriend if he has to move for the job. As much as it hurts, he and his boyfriend realize that for each of their careers, they may be separated for a little while. 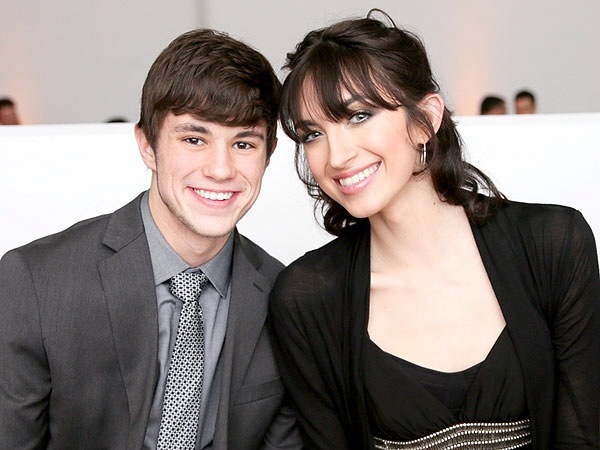 It breaks my heart because they wonder if their relationship is strong enough to survive a long-distance relationship. I firmly believe their love for each other is strong enough to pull them through. Honestly, they were made for each other, and I don’t want anything to pull them apart. I told my friend that he had to read this book. I don’t want to give it away, but it does show that while there are ups and downs in long-distance relationships, love and faith can keep them together. I hope when he does read this book, he will see that it can work. You may think, “It’s just a book, Joe. 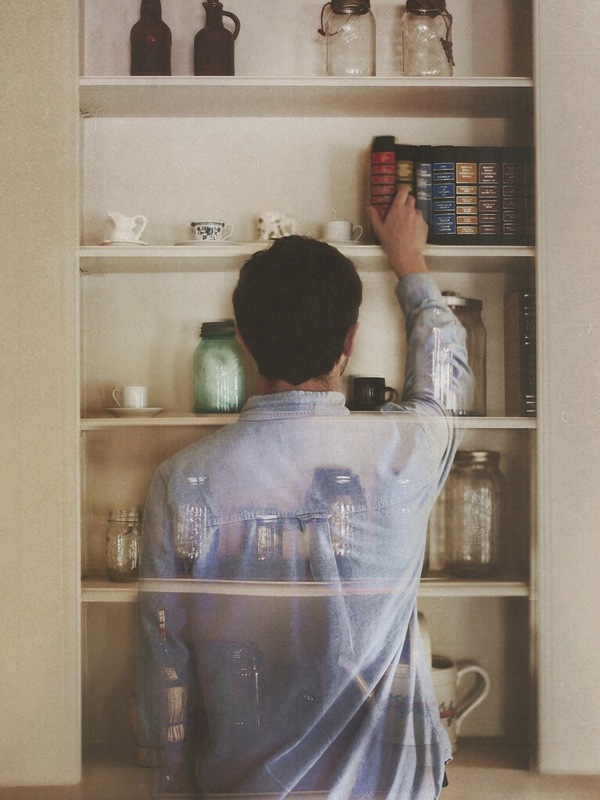 It’s not real life.” However, as my friend, who also loves to read Amy Lane, pointed out to me recently, Amy Lane is a master of understanding the human psyche and emotions. Her understanding of human nature reminds me a lot of Shakespeare’s understanding of human nature. When I teach Shakespeare, I mention that one of the things that make him great is his mastery of the range of human emotions, the understanding of the human mind, and the nature of humanity. However, I sometimes find Shakespeare’s characters to be unreal, but I find Amy Lane’s characters to be very real in many way. Her characters are flawed, not as in a bad writer flawed kind of way, but in the way humans are flawed. Amy Lane is a master when it comes to writing and character development. I just absolutely love her. I would love nothing more then to be able to just sit and talk with her for hours. Maybe she could even teach me to knit. Knitting is often a therapeutic exercise for some of her characters, and reading about knitting just makes me want to learn how. I see how much it helps her characters be calm and sometimes, I wish I could have that tranquility. The Protestant Cemetery of Rome, now officially called the Cimitero acattolico (“Non-Catholic Cemetery”) and often referred to as the Cimitero degli Inglesi (“Englishmen’s Cemetery”), is located near Porta San Paolo alongside the Pyramid of Cestius, a small-scale Egyptian-style pyramid built in 30 BC as a tomb and later incorporated into the section of the Aurelian Walls that borders the cemetery. 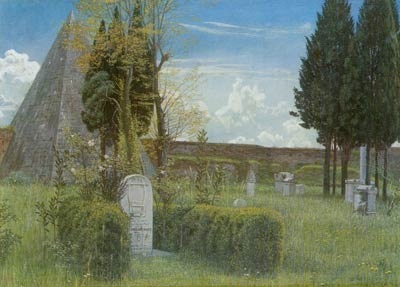 The presence of Mediterranean cypress, pomegranate, and other trees, and a grassy meadow suggests the more naturalistic landscape style of northern Europe, where cemeteries sometimes incorporate grass and other greenery. As the official name indicates, it is the final resting place of non-Catholics including but not exclusive to Protestants or British and Americans. It contains the graves of many Orthodox Christians, Jews, Muslims and other non-Christians. It is one of the oldest burial grounds in continuous use in Europe, having started to be used around 1716. The Cimitero Acattolico di Roma contains possibly the highest density of famous and important graves anywhere in the world. It is the final resting-place of the poets Shelley and Keats, of many painters, sculptors and authors, a number of scholars, several diplomats, Goethe’s only son, and Antonio Gramsci, a founding father of European Communism, to name only a few. When you visit this cemetery in Rome, one of the first sites you see is the Pyramid of Cestius. I have to admit, the Protestant cemeteries in Rome and Florence were two of the highlights of my research trip to Italy several years ago. Not only are cemeteries a great source of research, but also the gravestones are often more than just markings for the dead, but works of art. 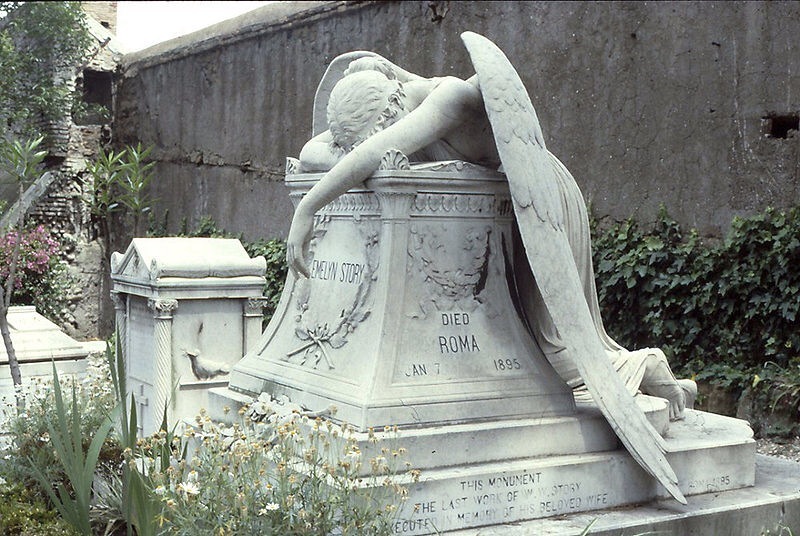 One of those pieces of art is the Angel of Grief, an 1894 sculpture by William Wetmore Story which serves as the grave stone of the artist and his wife Emelyn Story. The grave is now used to describe multiple grave stones throughout the world erected in the style of the Story stone. If you are ever in Rome, you really should visit the Cimitero Acattolico di Roma. 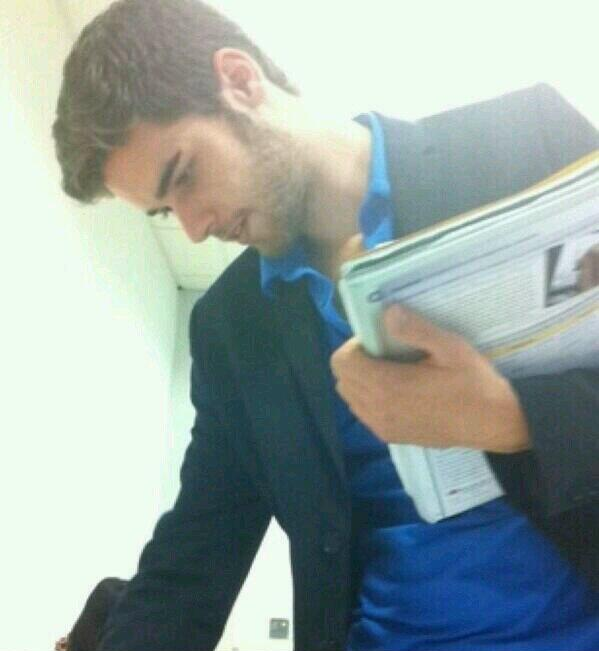 So where do we go, all the teachers, when the bell rings at 3 o’clock? Students don’t really think we go anywhere. Except home, maybe, to grade papers and plan lessons and think up pop quizzes. And when students find out otherwise, it’s a strange experience. Many people remember it vividly: the disorienting feeling of encountering your teacher in the grocery store, or in the line at McDonald’s, talking and acting just like other grownups. A jarring reminder that teachers have lives outside the classroom. But of course teachers go off and do all sorts of things: They write books and play music and run for office and start businesses. For some, a life outside the classroom is an economic necessity. In many states, more than 1 in 5 teachers has a second job. I currently don’t have a second job. I used to teach adjunct at a local college, but because of cutbacks and changes in administration, I no longer teach there, though I’d very much like to be in the college classroom once again. However, one thing my students don’t know is that I do actually have a social life. I sometimes go to the movies, I go shopping (when I have the money), and I write this blog. Through this blog, I have friends all over the world, which is something hat would shock my students to no end. I also read a lot, which is something my students expect of me. Many though would be surprised to know that I cook nearly every night. I love cooking and it’s one of my hobbies, so is occasionally doing arts and crafts. To be honest though, my life is often pretty boring. School takes up a lot of my time. Even when I’m not home, I really am sometimes grading papers, making quizzes, and preparing lesson plans for the week. Being a teacher is not an easy job, and we have to find our own rewards for it. More often then not, students don’t see the work that goes into balancing a life and being a teacher that does their best to provide them with the best education possible.